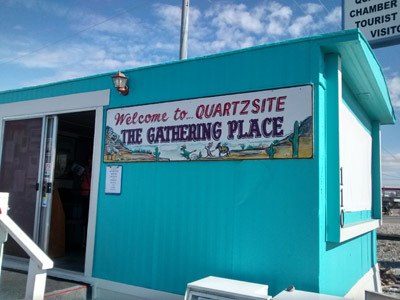 After numerous visits to Quartzsite, Arizona (or "Q" as millions of RVers who boondock here every January and February call it), I think we finally figured out the attraction. RVs, boondocking in the desert for as far as the eye can see. This photo taken after many had already left. 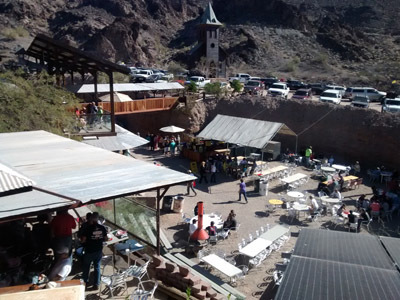 Fifteen years ago, both Randy and I felt our stomachs turn as we drove through the dry, dusty back streets of this small Arizona town for the first time. It was early December. When the rusty-shack homes gave way to double-wide trailers we realized we'd reached the affluent section of town. A building with a foundation would imply a commitment; I'm not sure anyone intentionally settles in Quartzsite permanently. 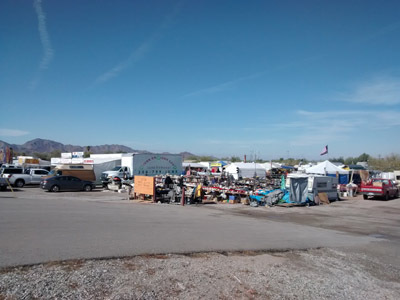 On that first visit, we wandered through a few tired, tented swap-meet zones where dusty boxes of small RV parts and thrift-store rejections were piled high upon every surface that resembled a table. We looked at each other and said, "This is it? 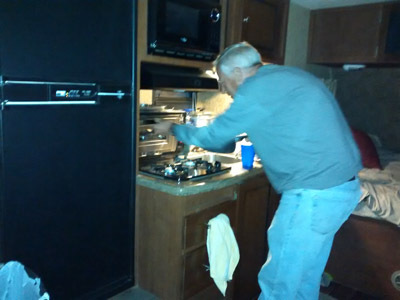 THIS is what draws millions of RVers every winter? Why?". We knew there had to be more to it! Despite warnings of hour-long traffic jams and crowded camping, this year we were determined to find out. 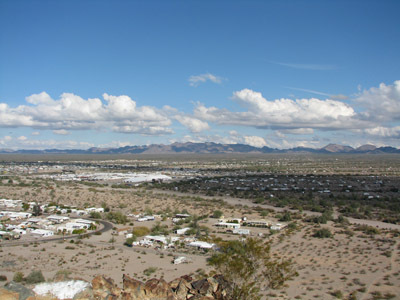 Every year the population of this town goes from 1,900 to 75,000 and over a period of two months, more than 1.2 million RVers pass through Quartzsite. We had always presumed they came for the largest gem and mineral show in the country. Or to attend the giant RV show, centered around a "Big Tent" filled with vendors offering great deals on everything RV-related. We'd also heard a lot about the swap meet. During those two months, it extends into every empty nook and cranny of town. All of it happens simultaneously; it must be quite an event! But I think all of our presumptions were wrong. I don't think these are the prime attraction at all. The swap-meet prices are double those in the thrift stores and garage sales where most of these "treasures" originated. I would gladly swap anything for a shade tree! Only about 30% of the vendors at the "RV Show" sell anything even remotely related to RVing. 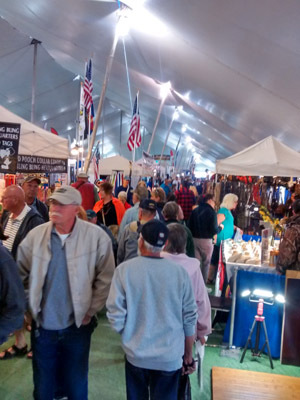 The Big Tent RV show – a great place to shop for T-shirts, jewellery, and kitchen gadgets! 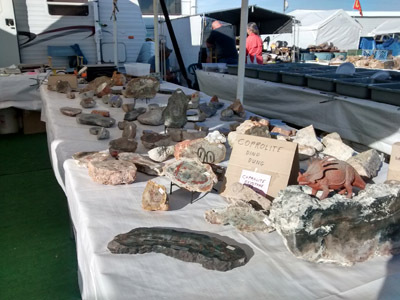 We did enjoy the gem and mineral show but found out it's no longer the largest in the country. That show has moved to Tucson. I chose this photo for our grandsons; they LOVE dinosaurs! We should have realized it sooner. The sign on the Chamber of Commerce office makes it pretty obvious. "Q" is "The gathering place". 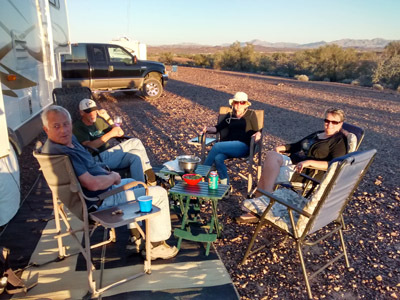 Every January, "Q" hosts an unofficial reunion of all the RVers who you have met on previous travels as well as an opportunity to meet those you have always wanted to meet. Have you ever noticed it's difficult to stay in touch with people who you connect with on the road, especially if you don't see them again for many years? When we hail from various states and provinces and the road takes us in opposite directions, it's easy to lose touch. But "Q" throws a party every year. We just have to show up; some of our friends from years ago are bound to be there! This was certainly the case for us. We met up with dear friends from previous travels. We camped with them at a secret more peaceful location, a few miles from "the fray". Bruce and Sheila took us to the Desert Bar - a first-time visit for us since we'd never drive our RV there. What a hoot! On our final evening together, we were treated to Greg's fabulous cooking! After that we connected with "old friends we hadn't met yet" when we finally met Brad and Marilyn Gris, great supporters of my guides for many years. They love hiking in the southwest as much or, perhaps, even more than we do and, although they live in Ontario, only an hour from us, it seems appropriate we would meet here first. 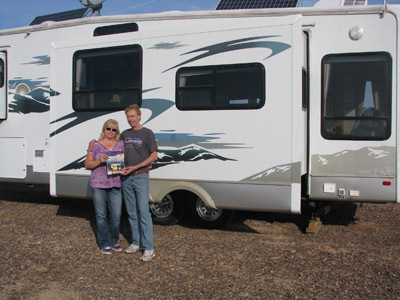 Brad's article on boondocking is featured in this month's edition of the RV Gazette Magazine. Brad and Marilyn: magazine celebrities! They introduced us to their fun group of friends. We stayed longer than we had planned (no surprise) when we were invited to our first campfire of the trip. Our friendship circles just keep growing! 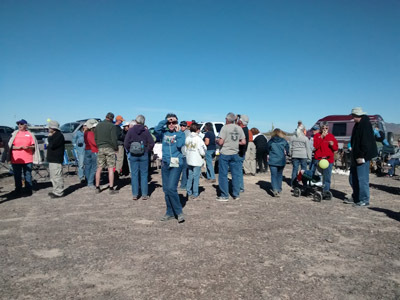 All over the desert surrounding "Q" at this time of year, there are groups gathered according to special interests, holding mini-rallies with happy hours, campfires, and getting together for pizza and beer at Silly Als or car-pooling to Nellie's Desert Bar Saloon. My thanks go out to David of Plein Air Journey,for telling me about an organized bloggers gathering - the first one of its kind. I attended and had a great time! I hope the tradition will continue with extended hours next year. There simply wasn't enough time to talk to everyone I wanted to. For many of us, it was our first opportunity to meet people in the flesh who we felt we already know well from following their travel blogs for years. I think everyone felt like a celebrity as we all snapped photos of each other. 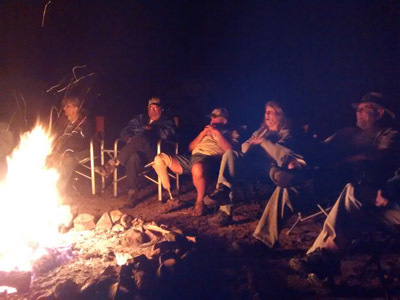 After 6 nights in the Quartzsite area, we know we've experienced the best of "Q": the camaraderie. It becomes quite infectious! 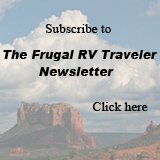 No wonder some RVers don't even visit the RV show, the gem show, or the swap meets while they're here (even though these are all free events). They know what they're here for: sunshine and friendship. We're moving on now but many stay in this area to soak both up for two months or longer. I was so pleased to finally meet you !